Our group together with Delmic and ThermoFisher presented two new cathodoluminescence microscopes that can take optical images at the nanoscale with a time resolution down to 1 ps. Click here for the press release. AMOLF, ThermoFisher and Delmic project team at on of the new ultrafast SEM-CL systems. 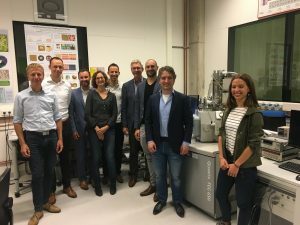 From left to right: Erik Kieft (ThermoFisher), Ernst Jan Vesseur (ThermoFisher), Nico Clemens (ThermoFisher), Sophie Meuret (Amolf), Toon Coenen (Delmic/Amolf), Albert Polman (Amolf), Sander den Hoedt (Delmic), Andries Effting (Delmic) and Magda Sola Garcia (Amolf).